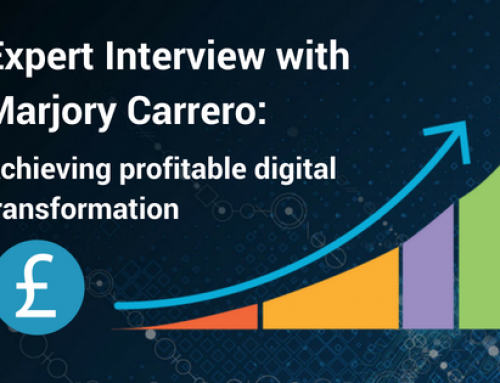 What is digital transformation and what is the best way to get going? Accenture Strategy Research estimates that the digital economy, involving some form of digital skills and digital capital, represents 22.5 percent of the world economy, digital’s ability to unlock value is far from being fully exploited. Many organisations may have started to think about digital transformation, but the reality is that it can be confusing – knowing the best approach to start, lead change and transform. Why are so many organisations struggling to get to grips with it? Sophie: Richard can you explain what you do within the context of DWG and the topic of digital transformation we are discussing today? I look after the strategy and leadership practice at Digital Works Group. My role is to focus on the vision, strategy and objectives behind what you are trying to do. 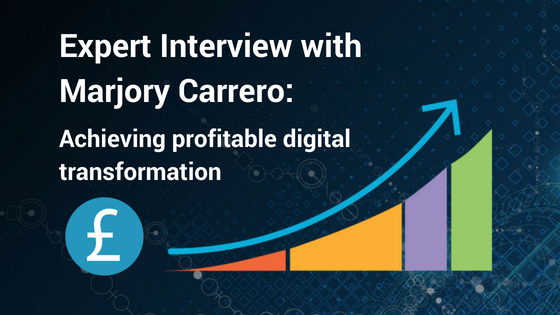 Why are you trying to transform digitally and how do you know when you get there? What is the measurement of success? What is your priority and ultimately to say, what does it mean? We help you to answer those important questions. Sophie: Digital transformation is a ‘hot term’, but often seems to cause confusion. Can you tell us what it means in simple terms? 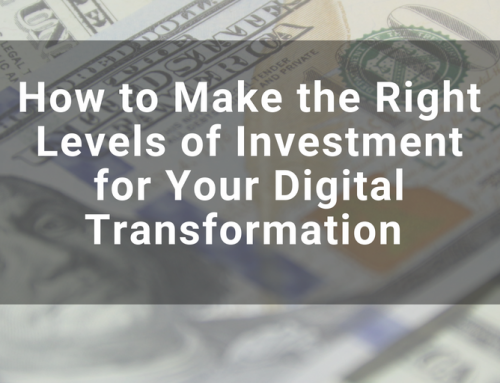 Digital transformation broadly means three things. Firstly, digital transformation changes the way you engage with your stakeholders; It means that your channels may now include digital channels – moving customers from face-to-face to online. It can also change the way that your employees engage with your organisation, so you may have HR systems that modify the way they apply for leave. It also changes the way that you communicate to all your stakeholders whether that be customers, employees, shareholders or the general public. The second area of change is how you operate; how you fulfil the purpose of your business or organisation. 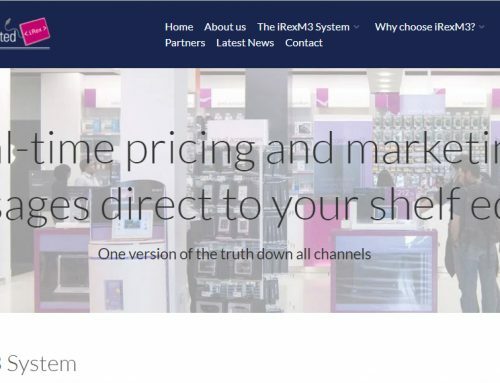 This is about digitising your business end-to-end; whether it be on the shop floor, how you change prices, how you deliver or how you logistically coordinate yourself to perform the tasks. Finally, and possibly the most talked about in digital industry, is how business models innovate. The stories of disruptors like Uber and Airbnb are all centred on the innovation of the business model in their fields, and how digital has been the enabler. At DWG we like to talk about all of this change in relation to a ‘Digital Evolution Curve’. 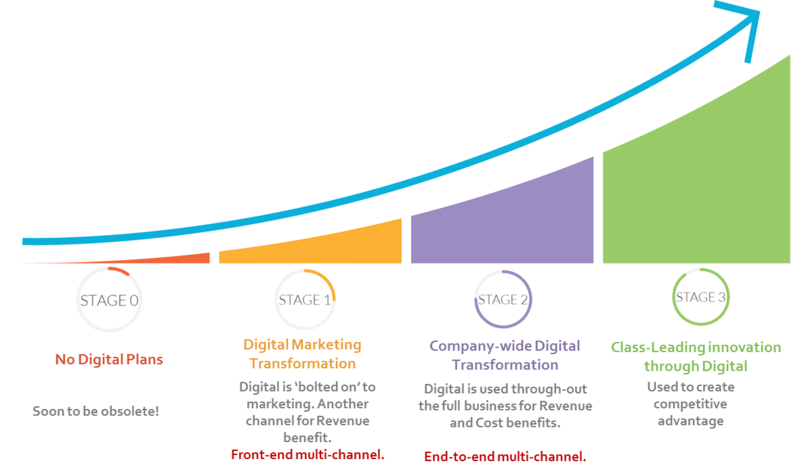 The curve has three stages; stage 1 is the digitisation of the front end of communications and engagement, stage 2 is the end-to-end digitisation of your organisation, and stage 3 is innovating using digital technologies. These three stages are prevalent across the majority of organisations and show how digital transformation is changing them. Sophie: Why is digital transformation so important for businesses? There are many reasons why digital is changing and disrupting, but it fundamentally comes back to a massive shift in customer behaviour. Customers are in multiple channels, and they talk to you in multiple ways, so you have to think about customer-centric design. To give you an example – on average people are on four digital devices now – a phone, tablet, laptop and a smart screen. Customers are also becoming incredibly discerning and impatient. On average 57% of customers will only wait 3 seconds for web responsiveness before they abandon a website. This is made harder when you throw in advertising that drops over the pages. If we look at the history of commerce over the last hundred years, we have moved from a model of build, and they will come (Henry Ford, you can have any colour as long as it is Black), to an advocacy model. A few years ago a consumer had maybe only four or five points of influence in their buying cycle – friends, family, what they read in the press or heard about the brand – but now we have over 20 on average. The web and the Internet have become the point of reference for people to discern information and you have to work to get their attention. It is all about convenience. People choose the channel that’s appropriate to them, and over 27% of retail sales now take place online, and that is set to grow. Sophie: Is digital transformation equally important for all types of businesses and industries? It is taking a foothold faster in consumer facing businesses. This is because these companies need to be more flexible and provide lots of options for customers. The business model in the consumer space changes much faster. In the business to business industry digital transformation is more focused on automation, cost reduction and innovation. For example, moving from a traditional print house to a digitised printing press that produces many types of print capability, to innovating to a fully automated business model. If you look at some of the online printing companies that produce your business cards, there are no people involved in that process, but the consumer experience is similar – you get a proof, have it printed and then delivered. I foresee that digital technologies will increasingly allow individuals to disintermediate the value chain, and start to go directly to the people who produce things. Moving from a process where you get what you are given, to one where you can customise and create something bespoke. Consumers are driving these changes. It is already happening all over the web. For example, people can design their furniture or clothing, and the order goes straight to the factory, not to a brand or a showroom. In the background, there is a second generation digital evolution relating to artificial intelligence and data analytics. The impact of these changes on the industry is harder to predict at this point, but there is lots of investment going on in this space. Potentially it may create a two-tier system, whereby those with information and artificial intelligence are stronger than those without these capabilities. It is still a developing case but will have a massive impact in the future. 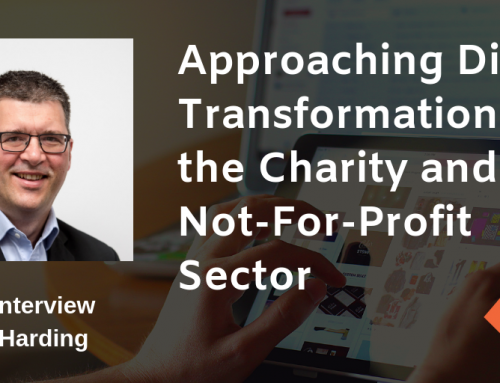 Sophie: If businesses are aware of a need to digitally transform, why, in your opinion are so many organisations struggling to get going with business change? Firstly, they don’t know what they don’t know. The digital arena is evolving incredibly quickly, and if we look back over time, businesses have changed over long cycles, in many cases years and years. That pace has stepped up, and so has the complexity. Traditionally businesses would naturally change as they went along. There was no real space or investment required in their choices to accommodate that change. The clarity of vision they needed was more generalised. ‘We will take the business in this direction’ was a typical statement in strategies years ago. Now, with the reliance on the technology, you have to be very specific about the direction. Technology has to be built, and it doesn’t happen overnight. Even as technology gets better and more adaptable, you will still need to know the detailed vision and objectives. Secondly, many senior executives simply do not have the experience or feel that they are qualified to drive the strategy and direction at the pace required, or they are disincentivised to do so. Many corporations in the UK are only incentivised on a very short cycle. They don’t want to spend much money because they want to underpin margins so they can get their exit. Sophie: What do you think are the top problems when it comes to digital transformation? What is standing in their way? It is the balance strategic direction and clarity versus execution. 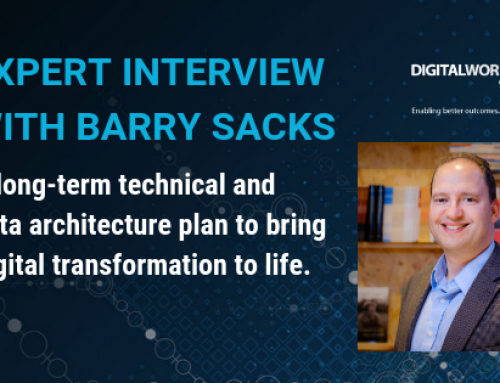 You have people doing lots of ‘stuff in digital’, without a clear remit or plan of where they are going – they are effectively making it up as they go along. The other extreme is you have people with a clear vision, but they are not executing. There are more cases like this, and the reason that they do not execute is due to lack of experience and skills. Layered onto this there’s a problem of not recognising the size of the challenge and the resource, time, effort and focus that it takes to get there. The problem is that boards tend to allocate tasks to an individual and that is the wrong way to go about it. Digital transformation needs to be recognised as a company-wide challenge, with a top-down approach. Everyone needs to be involved in transformation. What’s standing in their way? Nothing really. There are people around to help them, but it is that recognition that they have to adapt their risk profiles to be more aggressive to change. If they don’t change, they will die. Sophie: What do you believe are the most important elements when it comes to digital transformation? The most important things in digital transformation are to have that clear vision and strategy, objectives and targets. Knowing what you are trying to achieve, and then communicating this to customers, employees, and shareholders – this is what it means to you as an individual, so they understand the journey. Probably the most difficult conversations to have are with the shareholders and executives because transformation can be expensive. You have to put together a business plan that shows where the benefit is. In some cases, the benefit will be you are not going to go bust. Finally, generate the right environment or culture for change – this is a major invisible success factor when it comes to success or failure. Invisible success factors can be at a collective level; around leadership styles and history and ‘clearing away the war stories’, or on an individual level of ‘what does this mean for me?’. Both can disable your strategy. I think sarcasm and cynicism around digital transformation and change are always negative because it is a silent killer. Organisations who do not provide enough incentive to change run the risk of failure. Sophie: Are there any particular examples of how you have helped your clients get going with digital transformation? I was working with a large regulated business. There was a huge challenge to ensure they were compliant. Their focus was broadly on near-term survival, but at the same time, they were making massive investments in technology and developments that had a very long-term impact. They needed to carve out space and time for that future view for the board and shareholders to say ‘this is what it is going to look like’. We helped them to create a framework for that vision. To say here is the focus that you need, the structure and the real issues to solve. This clarity of vision could be turned into an actionable long-term plan for the organisation, while they went through the short-term pain. 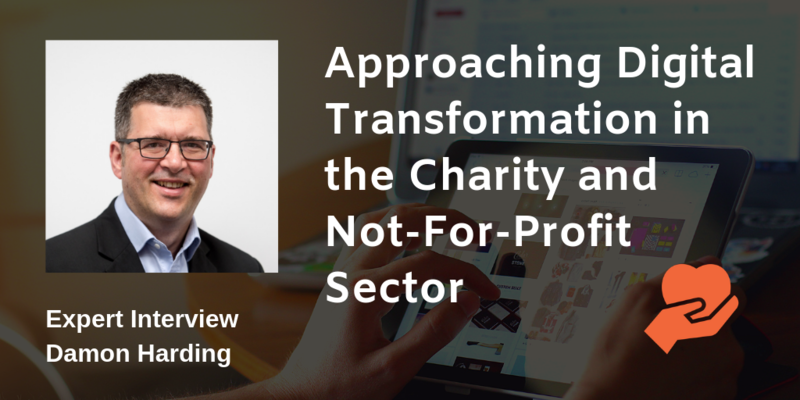 Conversely, we worked with another organisation that had bought into the ‘idea’ of digital transformation but hadn’t defined what that meant to them regarding actions. They were making sporadic and emotional investments, based on decisions that were short-term pain orientated. Rather than feeding the board, I challenge the board to come up with the answers. The help was from a strategic and leadership perspective; creating that vision and strategy, and then giving them the leadership and change frameworks to make it happen. Sophie: Digital transformation is complex. In your opinion what do you think is the best way for businesses to start to think through digital transformation in a structured way? At Digital Works we have a framework that balances strategy and execution. This framework is based on our own experience of making digital transformation stick, on a process of ‘think and do’; do the thinking ‘upfront’, then ‘do the do’. The number one thing to put in place is a clear vision over time of what you want to be. ‘Why am I doing digital transformation?’. Is it because of the survival of my business? Is it because I want to change the way my customers interact? For example, a retailer may say that we are going to move 75% of our sales online. That is a big goal, but it is evident as a transformational target. We always challenge our clients to think about this from a ‘people impact’. Whether it be shareholders, staff or customers – ask what is it going to mean to them? How will their interaction with you change? Starting at this point gives you the ability to create that vision. There are some key enablers alongside that. Firstly, digital transformation is not a ‘thing’ to be owned by an individual. Digital transformation is a company-wide activity, so everybody needs to understand what digital will do for them. Some other foundations are stakeholder-focused metrics and deliverables, and collective responsibility in the senior executive for digital transformation. Measure and track change centrally then you can follow the performance of your digital transformation. Have a collaborative environment and creation process; to focus on the impact on the user you need to think about all of their interactions, where groups from IT, revenue assurance, audits, retail and supply chain work together to change and digitise customer experience – not done in silos and handed off. Finally, get communication and engagement going in your organisation. It sounds simple, but if you have a clear vision, and you are tracking centrally, you have got a constant conversation with people. Sophie: If there were some key pieces of advice you would give to a client before they embark on a major digital transformation project, what would it be? Have an understanding of what you want your vision to be and how it will change your organisation. Even if that is nascent and unproven. In some cases, it may mean we can survive, in other cases, it may mean we can thrive. Also, know where your starting point is; look at your organisation and ask what capacity do you have? That will give you a sense of the size of the challenge, and what is it going to take to make it happen, and how you get your message across to the stakeholders that this is a good idea? Secondly, build momentum. Start doing stuff. 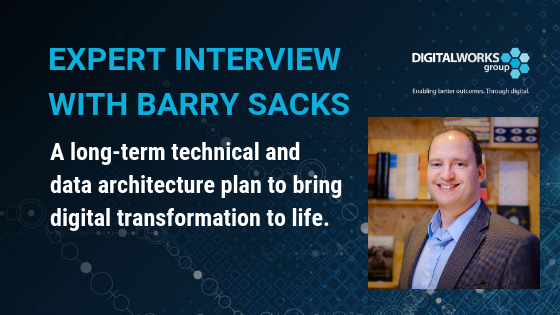 Even if it isn’t a 100% right because digital transformation is a journey and it is going to transform your organisation, potentially end-to-end. It is about having the tenacity to keep going. Finally, digital transformation can often fail because of what is invisible. A good illustration of this is a CEO I know who delivered a keynote speech to his executives. Unfortunately, the CTO was not in the room, as he set out a plan for the business to digitise itself and move significant proportions of its sales from retail to online. He said the plan was for it to take three years. His next comment was “Of course IT will be late (laughing) so it’ll take five years….we should build that into the plan”. This comment completely disabled the programme from the get-go, because everybody in the room instantly saw it move from 3 to 5 years. He gave the ‘get out of jail free’ card. That type of historical mantra or cynicism can disable a project very quickly. You have to develop the right culture of change in an organisation don’t give anyone any reason as to doubt your destination. 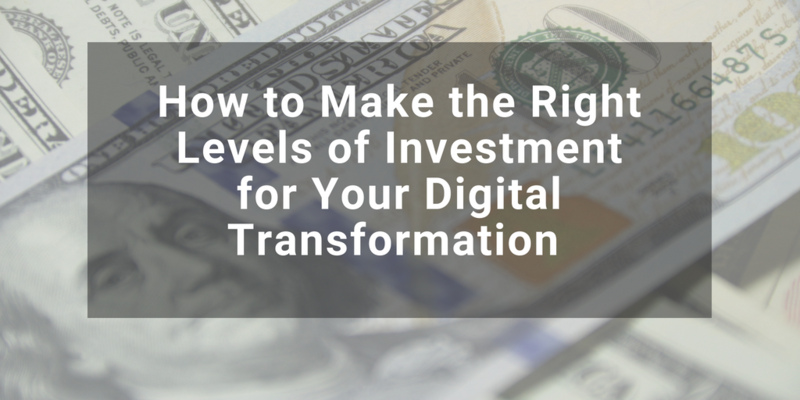 Need some help with your digital transformation ambitions? 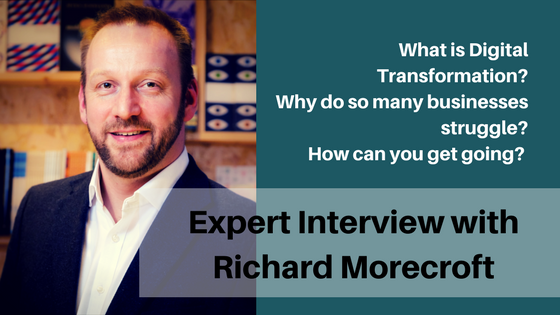 Richard Morecroft and the Strategy & Leadership team are highly experienced in helping businesses solve their digital transformation problems. We can help you to define your vision and create values and behaviours which allow your business to change and grow. Providing hands-on, down-to-earth, proven expertise. We are offering a free 1-hour consultation via Skype or telephone.